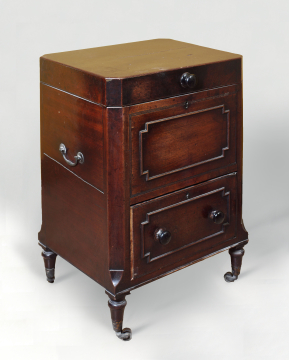 With canted corners, on four turned legs with brass castors; lift-up hinged lid with lock to lead lined compartment with six square divisions to hold bottle; cupboard beneath with hinged door and two wooden knobs which give it the appearance of a drawer; separate lock to cupboard; brass handles on either side. This is probably the ‘cellaret with lead lining’ listed in this room in the Furniture and Fittings inventory of 1837. It was bought in 1813 from John Robins whose bill dated 22 March describes it as ‘A mahogany octagon cellaret lined with lead, spring lock on a frame £1.5.0’.1 An American scholar, Susan Solny, has pointed out that it has no drainage hole, which would have made it difficult to use for the usual purpose. The cupboard might have contained the ice although it was also usual for the Butler to store corks in such a cupboard. She has also suggested that it might have stood in Soane’s Dressing Room because the cupboard contained a chamber pot – however, this seems unlikely as there was a watercloset just off the Dressing Room. This piece is not shown in any of the views of the Dressing Room drawn in Soane’s life-time, all of which look north, and if it was in the room must have stood in the south-east corner.1 It should be noted that amongst the items the Museum acquired from George Bailey, the first Curator was an octagonal cellaret and so it is possible that this piece does not have a Soane provenance and that the cellaret that stood in the Dressing Room is no longer in the house.